Understanding protein folding has many application areas in biology and biomedicine. For example, consider one of the major research areas of Doctor Peter Kasson's laboratory at University of Virginia: the study of how the influenza virus infects cells. In the past, Doctor Kasson and Doctor Pande have studied two aspects of this process: how the influenza virus recognizes the receptors on the cell surface to infect the « right » cell type and how small vesicles fuse. Doctor Kasson's group is now studying the function of the viral protein that controls cell entry, a protein called hemagglutinin. The hemagglutinin protein interacts with cell membranes: one piece inserts in the cell membrane, refolds, and alters the membrane in some unknown manner to promote the virus entry in the cell. Another piece links the virus and the cell membranes and refolds to keep the two together. Some simulations are running on Folding@Home to study each of these pieces of the hemagglutinin. Doctor Kasson's laboratory also looks at these processes experimentally. Both of these problems involve protein folding. 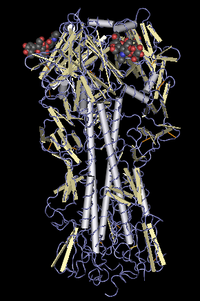 This extends the problem of understanding protein folding beyond the « canonical » model of an unstructured protein in water taking on a final shape but instead in the first case it is about a small protein inserting into a lipid membrane and changing shape in response to its environment, and in the second case, it is a large protein changing shape in response to physiological cues. Future news will address methods that Doctor Kasson's team has developed to assist in these studies as well as other important problems they work on. The team is also contributing to improve the efficiency of running Folding@Home simulations and analyzing the results. The Folding@Home community has made an importent contribution in providing the computing power for these studies (as you can see on the project results page) and the researchers are grateful to all donors involved.